Having lost a large quantity of data after my computer crashed late last spring I do not have the name of the person who wrote me the following solution. I just hope I will soon receive a message from him in order to provide proper credit and correct possible mistakes. 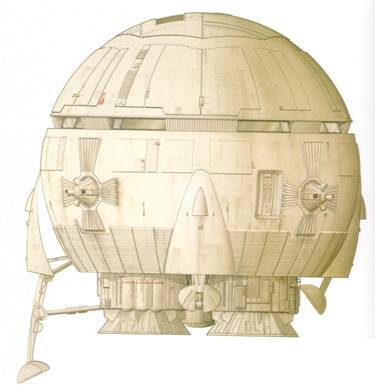 Let’s assume the very probable possibility that the Aries-1B is equipped with numerous close-circuit video cameras in most of his blind and remote spots to allow the crew to visually inspect the vital parts of the craft and be assisted while performing complex manoeuvres (like docking, undocking and landing procedures). 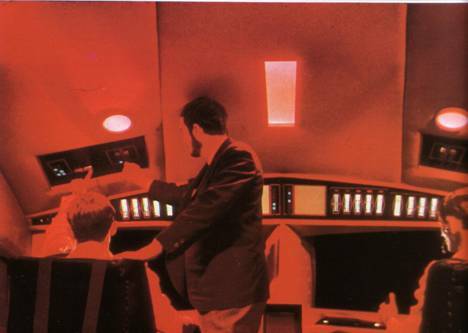 We can therefore extrapolate the fact that the window section of the cockpit is more than a panoramic glass curtain. Instead it could be a semitransparent liquid crystal flat screen video device allowing both direct and “camera aided” vision. 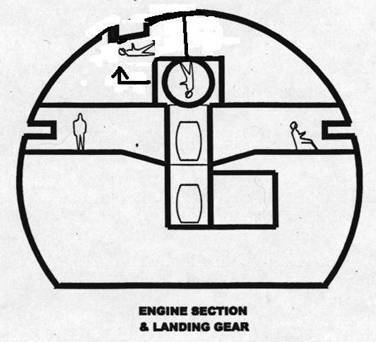 The beauty of this proposition is that it would explain how the crew can land vertically the craft while allowing him to see the landing site from the perspective of an observer positioned where the remote landing cameras are, namely just below the equator of the sphere. You have drawn the Aires 1B cockpit as if both one of center lines of the spacecraft goes through the middle of it. If you look closely at the descending picture in your website the cockpit's bottom looks in line with the "equator" of the spacecraft (that is at a 90 degree angle to the passenger section). So the "flight attendant" goes in the direction of the 2001 reality but has to make a 90 angle turn into the cockpit (in the direction of normal flight motion). "North Pole" and the bottom of the cockpit window is well above it. In Rev A attached, I have the window as depicted by the descent picture.